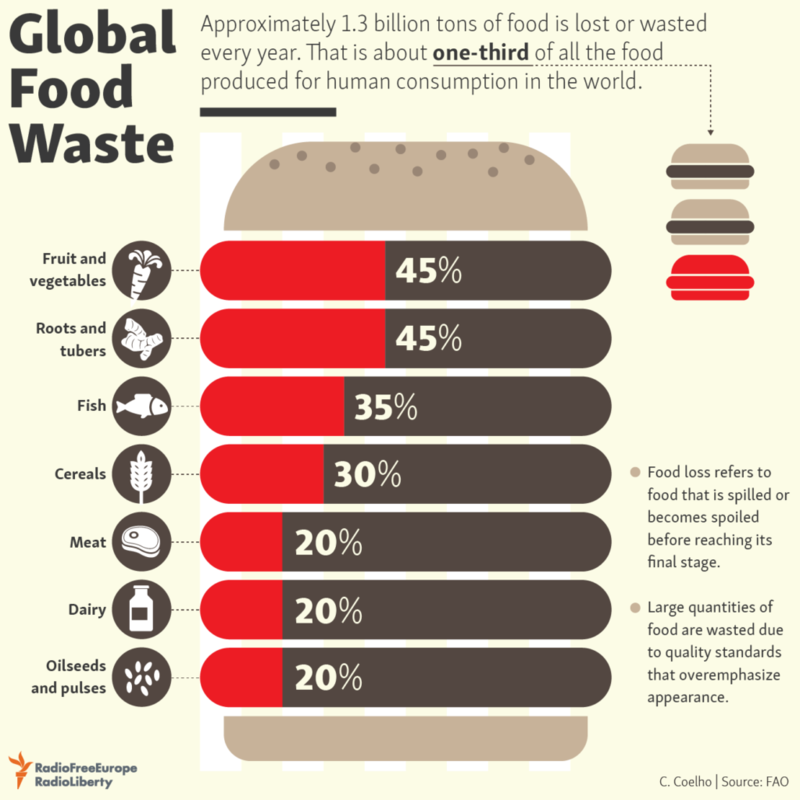 Food waste is an unfortunate problem that everyone in the world is facing with. It resonates loud at executive boards, activists and general population. Everyday at home we throw away about 1/3 of our daily food and this happens in millions of households world wide. This entails an annual waste of approximately 1,300 million tons and annual economic losses of $ 940 billion. “It means that more than a billion tons of food never gets consumed each year, while one in nine people remains undernourished”. […] Reducing food loss and waste therefore can generate a triple win: for the economy, for food security, and for the environment.” (Craig Hanson – Global Director of Food, Forests and Water at WRI, and Peter Mitchell – Head of Economics at WRAP). But what is food waste? The FAO also reminds us that an estimated one-third of all food produced for human consumption is lost or wasted world-wide. This waste is generated in all phases of the production chain (collection – processing – distribution – consumption). Although its incidence is directly associated with the country in which each of them is developed. 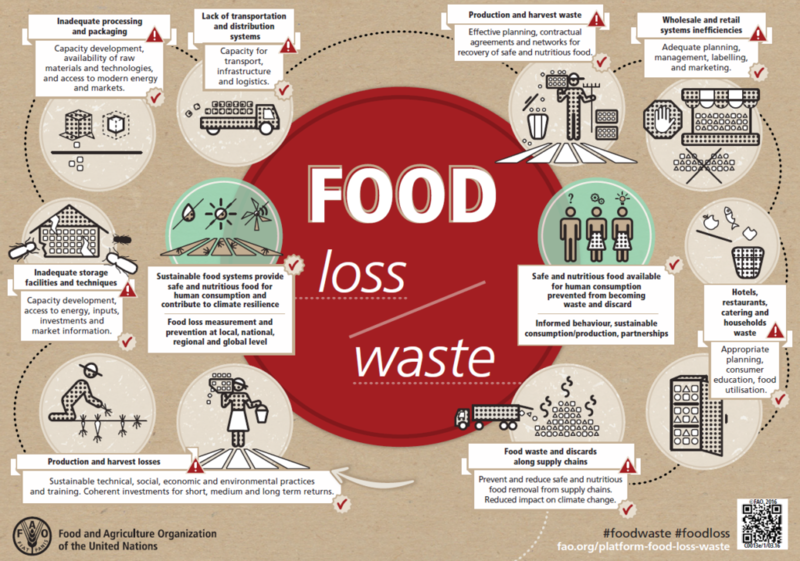 FAO infographics to expose the origin of food loss and waste. The per capita amount of food wasted by consumers is 95 kg (210 lbs) to 115 kg (250 lbs) / year in Europe and North America. In in sub-Saharan Africa and South, and Southeast Asia only 6 kg (13 lbs) to 11 kg (25 lbs) / year is wasted. Food waste in industrialized countries are as high as in developing countries. Although it must be taken into account that in developing countries more than 40% of these losses take place in the post-harvest and processing stages. In developed countries, that same percentage occurs in retail and consumption. Consumers in industrialized countries waste almost the same amount of food (222 million tons) as the total net food production in sub-Saharan Africa (230 million tons). It is estimated that food waste could rise by almost to third by 2030 when more than 2 billion tonnes will be binned. “Food waste is a glaring measure of inequality. 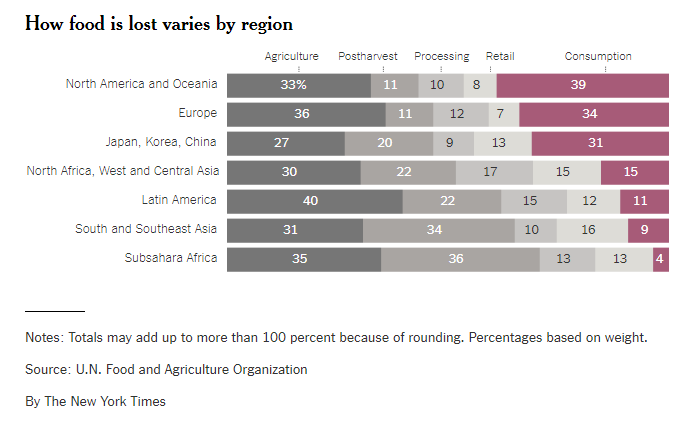 In poor countries, most of the food waste is on the farm or on its way to market. In South Asia, for instance, half of all the cauliflower that’s grown is lost because there’s not enough refrigeration, according to Rosa Rolle, an expert on food waste and loss at the United Nations Food and Agriculture Organization. Tomatoes get squished if they are packed into big sacks. In Southeast Asia, lettuce spoils on the way from farms to city supermarkets. Very little food in poor countries is thrown out by consumers. It’s too precious. Each year the U.S wastes 35 million tons of food, as much as 115 Empire state buildings. All this numbers certainly “stink!” as Universal Pure states. The author Jonathan Bloom of the book “American Wasteland” also explains that the United States could fill a college stadium with the amount of food it wastes in one day. Can you imagine trying to fit 365 football stadiums to hold one year worth of American food waste? The numbers and data presented certainly can make some people rethink the way they approach their food habits, but it hasn’t always been this way. Hiperbaric was pleased to assist to the interesting presentation of Sarah Kolansky, Associate Director of Sustainability at Graham Partners about Food waste, that was offered last June the Annual Conference of the Cold Pressure Council. 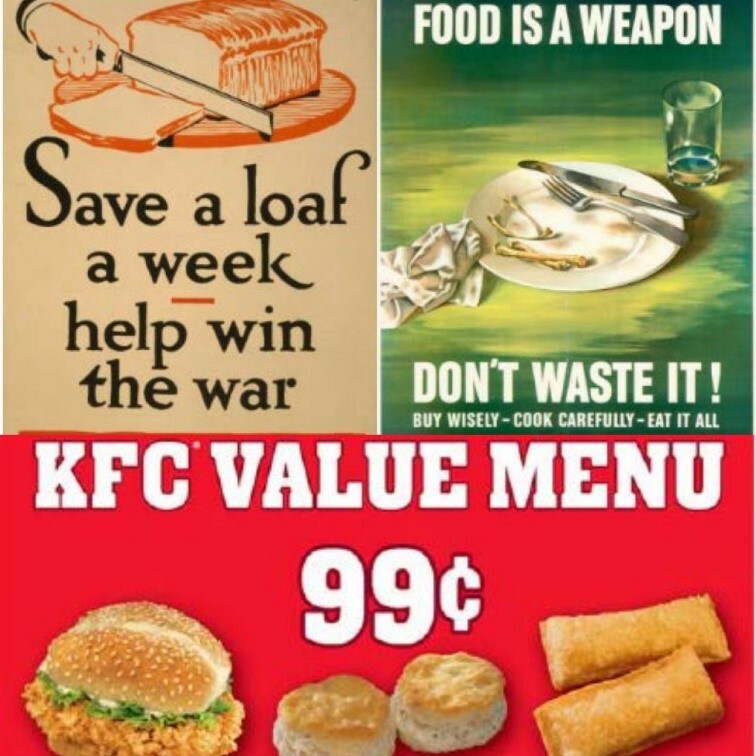 “Our value of food has changed, our vision of food has changed”, a visual example is clearly seen in the publicity spots that usual consumers receive; seventy years ago spots prayed for a responsible use of food (“Food is a weapon, don’t waste it”, “Safe a loaf of bread, help win the war”), while last decades, companies spend their time trying to release the best offer in a commercial trade full of all kind of products. “The amounts of waste and the social, economic and environmental implications are serious if we don’t change the trajectory. When we fight food loss and waste, we also fight hunger, poverty and global warming.” (Esben Hegnsholt – Thomson Reuters Foundation). The United Nations Environment Program shows that “Moving towards more sustainable food systems is critical. Urgent attention is required to address existing challenges, as well as new and evolving demands on our food systems.” This is why it was created the Sustainable Food Systems program. Its activities aim to raise awareness as well as catalyze action at local, regional and international level. 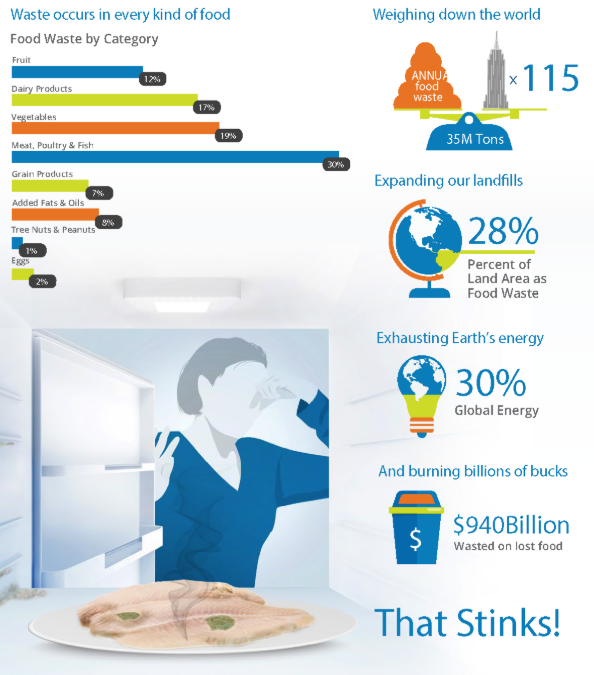 Food waste that is sent to a landfill creates methane gas, methane is 23 times as potent of a greenhouse gas as CO2. According to Climate News worldwide, food waste contributes 8% of greenhouse gases annually. Approximately the same amount as emissions from road transport. If the uneaten food were a country, it would be the third world producer of greenhouse gas after the US and China, with a total of 3,300 million tons of CO2 per year. How will we deal with the consequences of this irresponsible production when, in 2050 we will be greater than 9 billion people worldwide? Did you know that water from 100 million Olympic swimming pools has been used to produce all the food that has not been consumed in the world in one year?. The total consumption of water, necessary for the production of wasted food is 250,000 million cubic meters of water per year. In terms of energy, researchers estimate that 30% of all worlds’ energy consumption is accounted for the agri-food system. According to Universal Pure in their Food Waste White Paper, “the further food and drink travels through its supply chain, the more of a drain it has on energy usage”. Food waste isn’t just big numbers and data, but it is also very expensive. The most recent NRDC report states that it cost about $218 billion / year. To place those numbers in context, is about the State of California’s entire budget last year. Ultimately, the world economy takes a big toll of $940 billion per year while losing one-third of the food production that goes to waste. A well-known example of this profitability is our customer Tommies who participated in the project “Too good to waste (TGTW)” with an Hiperbaric 55 equipment. The goal of this project was to give supermarkets and suppliers a chance to make their vegetables and fruit available for additional processing into soups and juices. And the results were stunning! Do you want to see it? High Pressure Processing (HPP) industry joins this fight pushing down suppliers and service providers to focus on sustainability. 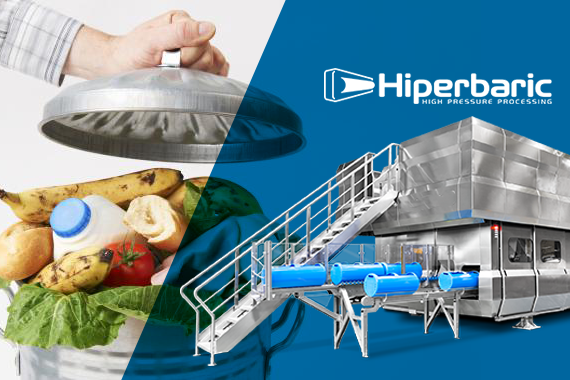 HPP processes food with water pressure instead of heat to inactivate both pathogens and spoilage microorganisms, extending the shelf-life of certain foods (meats, juices, dressings, dips, soups, ready-to-eat meals) from few days to weeks or months! It also preserves practically all nutritional properties of processed foods. This converts HPP into an alternative to take into account for the food waste problem. It can help in both the implementation of food sustainability policies in the food industry, and in the individual contribution of the consumer. All this to aim to reduce their daily food waste and promote sustainable and healthy food. Global food waste by products. In this same line we should start putting in place programs and food systems that promote the availability and accessibility of fresher and more nutrient dense foods for everyone. High Pressure Processing (HPP) offers an alternative non-thermal process that can deliver upon the much needed change. The fact is that worldwide, agriculture produces 22 percent more vitamin A than we need. However, due to the loss and waste of food, the amount available for human consumption is 11 percent lower than necessary. Therefore, reducing this waste of nutritious foods could lead to important health benefits. Annual orange juice consumption per person in the United States was estimated to be 13.6 liters in 2014 according to the USDA. To achieve this demand, millions of tons of fruits are lost in fields, warehouses, packaging, distribution, supermarkets, restaurants, etc. It’s important to minimize the amount that is wasted and applying HPP to fresh juice extends shelf-life to between four and six months, preserving its richness in nutrients and contributing, therefore, to sustainable food. The table below shows the advantages of HPP fruit juice and the contribution to reduce food wastes. On the other hand, the extension of the shelf-life with HPP technology aids to modify or eliminate traditional store practices, too, because instead replenish its stock every two or three days, they can do it every week or month, minimizing the transport. We must also bear in mind that over the years, supermarkets have embraced high cosmetic standards for fruit and vegetables, leading them to reject even marginally imperfect-looking food (e.g., too short, long, big, small or uneven in shape, too red or not red enough, and so on). This together with the expired foodstuffs comeback from large retailers to industries pose 5 percent daily of food waste and high pressure processing can give them a new life after as we remarked with the Tommies’ example. Finally, to combinate the HPP technology with reclosure systems for packaging such as the used by our Brazilian customer BRF in its Sadia products, enables us to further extend shelf-life in refrigerated and reduce the food waste. In short, HPP technology is in line with the fundamental objective pursued by all strategies defined to alleviate this global problem, that is, to prevent food waste by promoting a real change of attitudes and work procedures, reducing environmental pressures and contributing to a more sustainable production and consumption model. Contribution of HPP to the reduction of food waste. If you want more information about how high pressure processing can help you reduce food waste, do not hesitate to contact us.